Attendance is a benefit available only to members of the Center’s Industry Affiliate Program. For more information please contact Brant Cheikes. The Center for Data Science organizes a data-science-specific recruiting event each fall exclusively for its Industry Affiliate Program members. Unlike typical campus career fairs, this “researcher to researcher” event emphasizes state-of-the-art scientific content and the opportunity to explore students’ technical interests and capabilities in depth. At the heart of our Career Mixer is a poster session in which data science BS, MS and PhD students present their research and projects. Following the poster session, students visit company tables to continue the conversation and learn more. 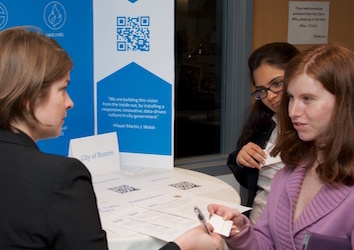 Last year’s event featured 70 student posters and 27 representatives from companies including Amazon, BAE Systems, Google, IBM, Lexalytics, MassMutual, Meta, Microsoft, MIT Lincoln Labs, MITRE, Oracle, Pratt & Whitney, RelayHealth, and Twitter. Most companies sent research scientists and engineers to take full advantage of the event’s technical content. The event includes a standing dinner served by UMass dining services, ranked #1 for university dining in 2017 by The Princeton Review, and an open bar. In advance of the event, the Center provides an electronic “resume book” containing one-page bios for each participating student. Data science courses taken by students include machine learning, deep learning, systems for DS, algorithms for DS, natural language processing, information retrieval, machine vision, statistics, and many more. Thursday 2, November 2017, 3:00– 7:30 P.M.
3 - 4 P.M. Industry Affiliate Board meeting. Join the discussion with Center Director McCallum, Executive Director Cheikes and Educational Director Marlin, hearing about the Center’s activities, accomplishments, and plans, including new faculty hiring, updated educational offerings, innovative research initiatives, and various industry partnerships. The majority of the meeting will consist of discussion where industry members give feedback, and we make plans together. On this year’s agenda are discussions of student recruiting and sponsored research outcomes from last year, MS student mentorship opportunities, access to our high-performance GPU cluster, and new joint research initiatives. 4 - 6 P.M. Student Poster Session. 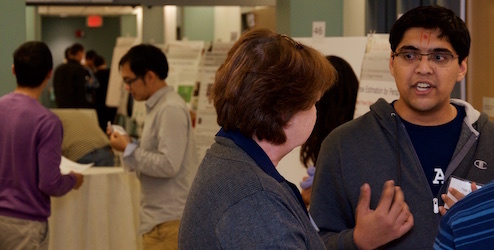 Explore posters where BS, MS and PhD students present their data science research and projects to industry attendees, faculty and other students. Learn about the latest work at UMass. Get to know students, their work, capabilities, and technical communication style. Discuss research with data science faculty. The great majority of the students are from computer science, but some also come from statistics, engineering, business, and other areas. Each student poster indicates the student’s graduation timing, immediate job interests, geographic constraints, and faculty advisor name. 6 - 7 P.M. Industry Table Session. Students visit company exhibit tables to learn more about your company, its successes, challenges, and opportunities. Most companies bring logo banners and promotional materials. Some have demos and slides prepared to show students. All bring engineers and scientists to talk with students and answer questions. Faculty often also visit. Last year there were many examples of successful hiring for full-time and internship positions at all degree levels. Dinner will be available from 5:30 P.M. - 7:30 P.M. Parking is free (with passes we will provide) in the Campus Center Garage.